Sean, Tsering, Mama, Wei, Antonin, Paul & Chris summited Island Peak Oct 26 in perfect weather. After an evening at 5650m high camp Josh became ill and decided to stay back (He is feeling fine now). The rest of the team left at 3 and were on top between 6 and 8am. The team is back in base camp and despite being totally nackered, everyone is feeling fine. The team is now en route to Ama Dablam Base camp. Word from Ama Dablam has been promising but we wont really know for sure until the team gets onto the route. Sean,Tsering, Mama, Wei, Antonin, Paul & Chris summited Island Peak this morning in perfect weather. After an evening at 5650m high camp Josh became ill and decided to stay back (he is much better now). The rest of the team left at 3am and were on top between 6am and 8am. Everyone is back at base camp feeling fine and ready to move to Ama Dablam base camp on the 29th. As the team approached Island Peak, we noticed something different about Ama Dablam; the hanging glacier known as the Dablam has lost at least 2/3 of its total mass. The Dablam has been slowly peeling off over the past years but this is different, it's a major change to the character of the mountain Not that I'm one to revel in base camp gossip, but according to retreating teams, the route still isn't open above what's left of camp 3. We shall see and keep you all posted. On another note, the FTA team has reached Island Peak base camp and after sorting gear, doing a skills check and packing, we will move to high camp and if the wonderful weather holds, we will go for the summit on October 26. The team reached Namche Bazar last night and everyone is feeling great. We plan to stay here for 2 full days to aid in our acclimitization schedule. Today, we will climb up for some excellent views of Everest, Lhotse and of course the matterhorn of the Himalayas, Ama Dablam. Josh, Wei, Antonin, Paul, Me (Chris) and Sean are feeling the excellent energy and this amazing place. Everyone is getting very excited. We are headed up to climb Island Peak 6186M straigh away then Paul will go for a big trek up to everest base Camp. The rest of the team will go directly to Ama Dablam 6856M base camp and commence the main objective of the expedition. The south west ridge of Ama Dablam. The route is quite difficult but with the help of fixed ropes and Sherpa power, the objective becomes much more managable and a truely enjoyable experience. and the patina of sadness which covers the memory landscape is inescapable. allow us to once again savor them. apart by the aftermath of Guy's death. mountains we all love so much. of the world below his feet! A quick call from Stu in Tingri. Justin and Eric are already in Kathmandu. The others are waiting around Tingri for a landslide in the road to be cleared so their bus can get through. They expect to be in Kathmando late on October 9. Nima is already at the Nepal border waiting for them. 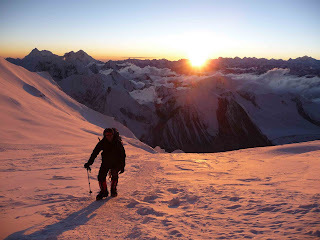 I have just had a long phone call with Stu from Cho Oyu BC. Thankfully the signal was reasonably strong and we did not lose the connection this time. It is now confirmed that Guy Leveille has perished on the descent. Guy and Stu Remensnyder, the team leader and head guide, were involved in what sounds to have been an epic descent after Stu summitted and then turned Guy around just 60m from the top at 3:45pm on Saturday. They were up above 7500m for nearly 28 hours. Guy had weakened considerably during the long climb down, and at an as yet unknown point fell and slid away from Stu. It is also now confirmed that all members have returned safely to BC. One or two will leave early tomorrow for treatment in Kathmandu, however we stress that everybody now is OK and out of danger. There were several dramas unfolding high on the hill during Friday and Saturday nights, involving multiple teams including that of the SummitClimb group. Another climber had to be rescuscitated with CPR after collapsing, and other climbers took long and dangerous falls and have been injured and evacuated. Stu sounded exhausted, but OK. He said the mood in the group was strong and they were well knit and hanging in there together in light of the loss of Guy. He hopes to have the team out by the 9th back into KTM. We need to publicly express our sincere thanks to the decent and professional people running the IMG group on the hill. Stu made the comment they were the only people who responded when the initial emergency calls went out on the radios at 2am that included a plee for oxygen to be brought up. They found the manpower and the resources necessary to aid in the rescues and we cannot applaud the actions of the IMG staff and team enough. Needless to say our deepest condolences go out to the family and friends of Guy Leveille, who have shown considerable strength in the wake of this tragedy, and his many work associates with whom we have spent some time on the phone with today at the Winnipeg Police Service. Stu will issue a more detailed report upon his return to Kathmandu, as mentioned, hopefully on the 9th October. It is with great regret that we confirm that the Field Touring Alpine team on Cho Oyu in Tibet has sufferred a fatality. Canadian team member Guy Leveille, whom was being assisted down from a high camp, fell at some point and has died as a result of his injuries. Communication with Cho Oyu BC is very unreliable, but we expect to be able to update the situation in a few hours with further information. Our deepest sympathies are extended to the family and friends and work associates of Guy Leveille. Two further FTA climbers have descended to Camp 2 and are on the way down to BC. Our current information indicates all other team members are accounted for and are safe.